This large-scale installation was the headlining piece at my recent solo show Reconstructions at Heller Gallery in New York City. The piece was based around the story of the Morgan Vase, a Chinese porcelain vase that was sold for $18,000 the same weekend as my opening March 8th in 1886. This caused such a controversy in the media that it sparked a fad throughout the US based upon the peach blow or Burmese color scheme (deep pink at the top, fading into white/cream at the bottom). Peach Bloom was a term used to describe the original color of the porcelain wares. 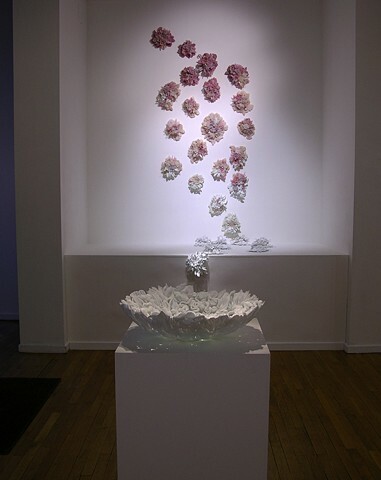 This piece will be on display in the Twenty-first Century Heirlooms exhibition at The Racine Art Museum through September 15, 2013.